Sauerkraut is pickled cabbage. To make it, cabbage is shredded, salted and left to ferment in a de-oxygenated environment for 4-6 weeks. The salt, via osmosis, pulls water out of the cabbage to form brine that helps protect the kraut while it is fermenting. 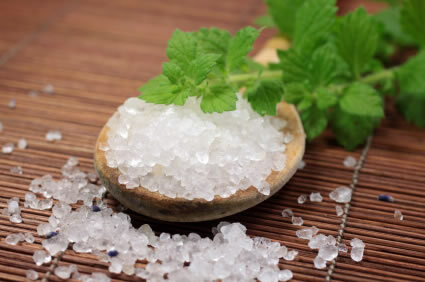 Some modern recipes use vinegar, but the traditional method just uses salt and occasionally water to add brine volume. Three phases of microbial activity produce lactic acid and improve vitamin content while converting sugars in the cabbage. The enzymes break the cabbage down into smaller, more digestible molecules and the lactic acid kills unwanted organisms. 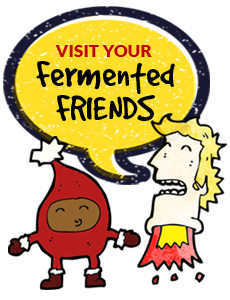 The term “lacto-ferment” comes from the lactic acid secreting bacteria present in a batch. Read more fun sauerkraut facts below! Earliest recordings of fermented vegetables come from NE China (Manchuria); some estimates are 4,000+ years ago. It is said the Genghis Khan brought the art of lacto fermenting vegetables from central Asia to W. Russia when the Mongols were conquering. This would be around 1237. It most likely trickled from there westward. Pliny the Elder wrote a couple lines describing the craft 2,000 years ago in Rome. East Asian trade routes could have carried these ideas to the Mediterranean basin whenever they started. Probably how olives came to be fermented into edible fruit. There are lacto-fermenting and yeast fermenting traditions for both food and beverage, all over the world. How is yours different from the nasty stuff in a can? Modern food manufacturers can or jar their kraut using heat in order to extend shelf life, some use vinegar instead of fermentation to sour it, and some that do ferment don’t ferment it as long. Pickled Planet sauerkraut is packaged into jars with it’s own brine solution, then refrigerated to preserve the vitamins, enzymes, and beneficial bacteria without any heat. Live sauerkraut also has a distinctive flavor very different from the canned version. 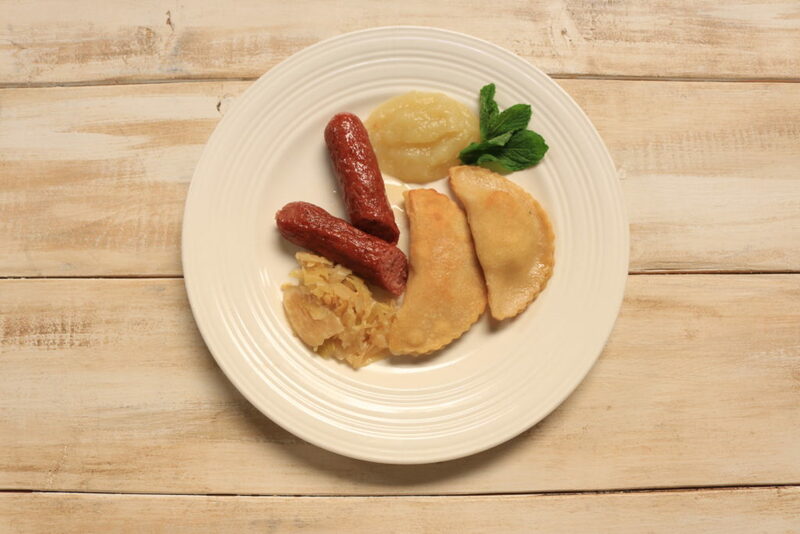 We also make our kraut in many delicious flavors. Well to begin with, what you buy is your vote, and this shapes the world systemically. If you buy to support healthy ecosystems and human scale food systems, eventually the world (meaning the entire web of ecosystems both physical and cultural) is healthier on the whole, which improves your health as well. As for your individual health, have a seat the list is extensive. Sauerkraut is good for you because it is a potent source of vitamins, including C, and several B vitamins for sure. It is good roughage. The lactic acid improves internal conditions for beneficial intestinal flora, balances stomach pH both directions, and helps break down proteins. The enzymes break molecules down into building blocks, easily absorbed and used by your body. Not just the cabbage in the jar, but they keep going to work in your digestive tract breaking down the food you ate with the kraut. This in turn gives your body more nutrition with less digestive effort and increases your over all store house of enzymes and energy for other projects. The easy nutrition increases your body’s availability to both purify and build various systems as needed. This means your muscles are less sore, you experience less heartburn, your liver works better, your joints are more lubricated. All body systems benefit from this nutritional equation and you have a net gain in over all vitality. Your immune system also benefits because beneficial micro-organisms, such as lacto-bacillus plantera and brevis populate your stomach. With a ready crew of micro-defenders protecting the main entrance of your body, many harmful organisms that enter your stomach, never make it into your blood stream. This gives the lymphocytes in charge of lung patrol better chances of defending that other major area of infection because they don’t have to mess with the stomach intrusions. You get sick less. What’s the deal with live and raw food? The words live and raw pertaining to food are both used frequently by many people to describe what ever their perception of them is. Here’s our take. Both theoretically contain enzymes because raw refers to un-cooked and most enzymes cannot tolerate high heat. Some raw foods are heated at low temperatures to enhance flavor or texture. I?m not sure about how live or raw these dehydrated replacement foods are really. Temperatures below 105 degrees F. are used to make raw crackers, pies and fruit leather. The sun is also available for this sort of thing. Live refers to food that is some how woken up as in seeds soaked and turned into sprouts or vegetables colonized with lacto bacteria like sauerkraut or kim chee. Pro-biotic refers to living microscopic organisms that are beneficial to human beings. They provide a broad range of services including defense against harmful bacteria that enter your upper GI tract. They are also responsible for digestive improvements and increased nutrient absorption. They colonize our GI tract directly and improve conditions for other healthy colonizers. What’s the difference between enzymes and beneficial bacteria? All enzymes themselves are proteins. They facilitate specific actions all over the minute world. For most peoples’ interest they aid in the break down and subsequent absorption of nutrients in our body and are generally found in food that has not been cooked. Lacto Bascilli strains secrete massive amounts of them. cellulase – breaks down cellulose, plant fiber; not found in humans. Real salt comes from the ancient sea that covered most of Utah. It is harvested by Redmond Real Salt and is full of trace minerals. It is less polluted than sea salt and that’s why we use it. We also use Himalayan miracle crystal salt from Pakistan. How can a jar be good for a full year? All vegetables have preservative and decaying bacteria on them in the field. Making sauerkraut favors the preservative bacteria by increasing lactic acid and lowering Ph. This low Ph kills off botchilic organisms as well. The bacteria actually preserve the cabbage as a medium for the purpose of increasing their numbers. It’s their transient home. We’ve left experimental jars at room temperature for months, even up to 1 1/2 years with no ill effects. We don’t suggest this but we can assure you if handled well (in your fridge) it will last for at least a year. Once you have a taste for it, good luck keeping it around that long. I bought a jar and it’s bubbly or fizzy and lid is bulged, is it ok to eat? Our products are all naturally fermented and we don’t pasteurize so living organisms are present. Some batches are more active than others and have residual activity. This activity includes some creation of CO2, which will make the product bubbly and the lid bulge. All batches are Ph tested for safety and are well below proper thresholds. We got a jar and it was different from the last one? Every batch is different, this is just how it is. The same recipe will be different because of different biological activity, different fields and cabbage strains etc. Sometimes it is crunchy and sometimes it is soft, sometimes more sour, sometimes a little bitter. We do what we can but the reality of things always tasting the same is a product of industrialized expectations of our food. Congratulations on embracing a realistic view of food products. Thank you. We use non toxic glue for lable adhesive and 100% post consumer recycled paper for our labels. This lowers the overall toxic foot print for our products but means some labels will fall off. They are also put on by hand, as all things are done here, so operator error sometimes gets less glue than needed on the jar. We got some pickles and they were mushy, is that ok? Well, not really, but they won’ t make you sick. The pickle industry uses calcium chloride as a firming agent, which is a laboratory product with little history of use for human consumption. It may be fine but who knows really, so we use grape leaf which doesn’ t always keep them crisp. Pickles are traditionally a seasonal product that people would have till mid winter or so. Cucumber pickles all year round are a possible because of vinegar, heat treatment and calcium chloride. We do what we can with the old school methods. Why can’t I double dip? Our mouths are the dirtiest places around and if the mix of germs and bacteria present in our mouth get into a jar of kraut they cause mold, rot and loss of texture. This double dipping is true with any food in your fridge, but the kraut will lose all that great shelf life, so please don’t double dip. What is the State of Jefferson? As it says on our label, we manufacture in Southern Oregon, which is part of a state that was shortly lived in late 1941. Pearl Harbor and US entry into WWII broke up the momentum and motivation behind the new state forming.